Technology is spilling into all areas of life and the latest advances in medicine are allowing us to explore solutions that have never been possible before. Whilst many will argue about the rights and wrongs or ethical consequences of such advancements, there’s no question that the opportunities for us as a species are immeasurable. 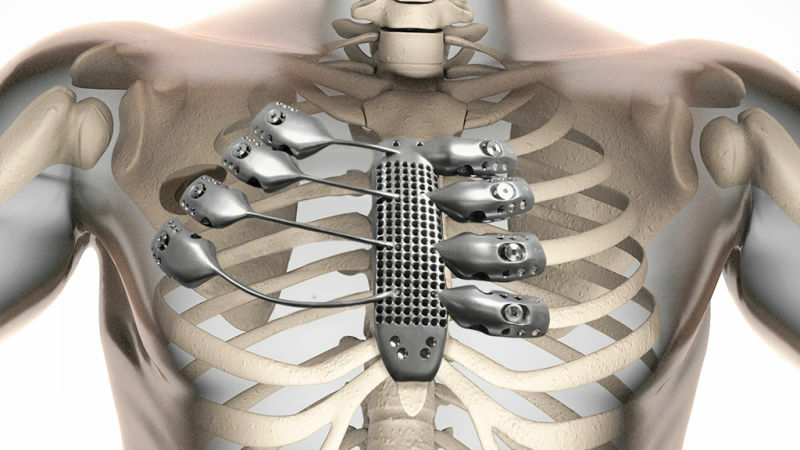 A case in point would be the man who recently had his chest rebuilt using 3D printing technology as part of an operation to remove a tumor from his body, which required him to have three ribs removed along with half his breastbone. Doctors reported that the tumor had grown to around the size of a tennis ball and the necessary procedure had left an extensive defect in the 71-year old’s chest. Surgeons at Morriston Hospital, Swansea carried out the eight-hour operation, which historically would have involved them reconstructing the patient’s rib cage using a special cement prosthesis. However, advances in 3D printing technology have allowed them to use a bespoke implant, leading the way for a revolution in major surgery. The procedure is believed to be one of the first times an implant of this kind has been printed in the UK, with the titanium replacement designed at Morriston and printed in Wales. Cardiothoracic surgeon Ira Goldsmith said, “It was a very extensive growth that needed to be removed. However, removing it also meant removing part of the breastbone and three ribs. “That would leave a large defect that could have destabilized the entire chest wall and reconstructing it was going to be a very complex procedure,” he added. Usually, a cement prosthesis would have been prepared during the surgery and generally takes a couple of hours to complete. Because the patient, Mr Maggs, from Abergavenny, Monmouthshire, was suffering from a number of health issues, surgeons were keen to keep the operating time to a minimum, which is why the 3D printing option was considered. The implant was made ahead of time-based on a design from by the senior surgeon. The possibilities of where we could take this technology offer us an exciting array of opportunities and years from now 3D printing is likely to facilitate much more complex solutions, including prosthetic limbs and perhaps even working organs.